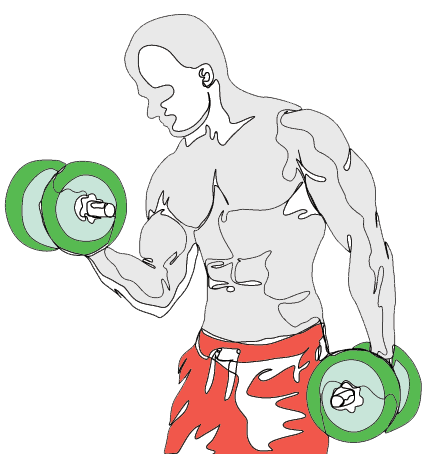 Real world experience and supportive scientific research has shown us that Resistance Training or High Intensity Strength Training, in general is best performed once or twice a week. This frequency appears to be optimal for the vast majority of individuals – there are of course potential outliers and exceptional circumstances. As a generally suggested frequency, this is probably as good as we are going to get. Of course this suggestion can be tweaked for the better and adapted to each individual, especially if we become masters of listening to our own body and our energy levels and use an intuitive appraisal of this biofeedback to decide the actual days on which we can exercise with intensity. In an ideal world, we would develop a very consistent and high degree of intuitive awareness of our recovery state. However, what if we could have a little assistance, some useable hard data that can help to guide us? Or at least to reinforce our intuitive summation of our internal biofeedback, helping us to choose to exercise intensely on exactly the right days. Technology that could provide us with such data would be both highly practical and very useful. The technology exists today and it’s called HRV. In the past, HRV technology was prohibitively expensive, available almost exclusively to astronauts, world-class athletes and their coaches, and some hospitals and researchers; but in the last few years, it has become affordably available to the general public via apps that track Heart Rate Variability. HRV stands for Heart Rate Variability, or very simply put the variation in the time interval between heartbeats. From an exercise perspective, HRV technology gives us a window into the state of our physiology; it’s a non-invasive method for tracking our recovery status post workout, our general stress levels and readiness to exercise intensely on that particular day. 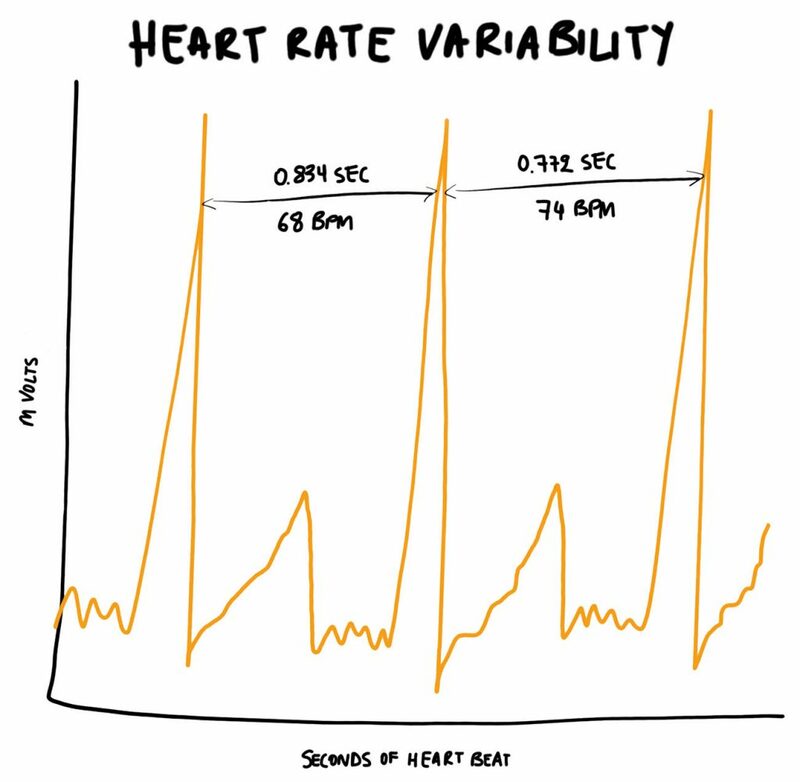 What is HRV or Heart Rate Variability? 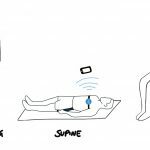 Most of us know about heart rate, the number of times the heart beats in a minute or “bpm”, and resting heart rate, the heart rate measured while being relaxed, but awake. Also, many are aware that amongst the general population a resting heart rate of 60-80bpm is considered pretty good. What is less well known is that those beats do not actually occur at precisely regular intervals. For example, if a resting heart rate is measured at 60bpm most people tend to assume that the beats will occur at consistent intervals, i.e. in this given scenario 1 beat every second. In reality, this consistency does not occur. There is variation in the time intervals between each individual beat. HRV is simply the measurement of this physiological phenomena, the measurement of the variation of the gap between heartbeats. A healthy functioning body will display a greater variability between beats than a poorly functioning one. 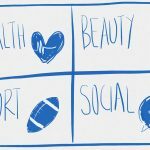 What dictates the variability between heart beats? To find out, let’s take a look first at the creation of the impulse that drives a heartbeat. There is a natural pacemaker found in the right atrium of the heart called the sinoatrial node. This node generates an electrical impulse that stimulates each beat of the heart, dictating the hearts rhythm. What influences the sinoatrial node? The sympathetic and parasympathetic branches of the autonomic nervous system are the key influencers on the sinoatrial node’s impulses. Hormones and immunity factors carried in the bloodstream also have an impact. The autonomic nervous system (ANS) is always at work controlling involuntary body functions such as breathing, blood pressure, heart rate, and dilation and constriction of the arteries. The autonomic nervous system consists of three branches. We will focus on the two that are most relevant to HRV: the parasympathetic nervous system (PSNS) and the sympathetic nervous system (SNS). The PSNS stimulates internal activities that are related to “resting and digesting” and being in a relaxed state. These activities are anabolic in nature: think repair and rebuild: stimulation of the digestive system, the immune system and the eliminative organs. We certainly want the PSNS to be performing well between our workouts. When PSNS activity is dominant, heart rate variability increases. This SNS dominates when we are in survival mode, when the fight or flight response is engaged. It represents a catabolic environment, there is release of the sympathetic hormones from the adrenal glands: the catecholamines, epinephrine and norepinephrine. Heart rate is increased, blood pressure increases and there is decreased blood flow to the digestive and eliminative organs. The SNS is in full-on mode during high intensity exercise. When SNS activity increases, heart rate variability decreases. It is important to note that just because one branch of the ANS may obviously be engaged at a particular moment, it doesn’t mean that the other is “switched off”. One branch can be more active than the other, or dominant at any one time, but both the PSNS and the SNS are always working to some degree. The SNS however can take precedence over the PSNS at any point because it represents something superiorly important to the organism: immediate survival. What influences the PSNS, SNS and HRV? All that is required today to track HRV is a Bluetooth heart rate monitor, such as the Polar H7 Bluetooth Smart Heart Rate Sensor, and an app. I have personally tested a couple of the available HRV tracking apps and the one I continue to use and highly recommend is Elite HRV, which is available for both iPhone and Android devices. Here is a screenshot from the app. The red line represents the heart rate and the green line the heart rate variability. Details on how to interpret the data will be in the second part of “The Beginner’s Guide to HRV”. The first thing you will need to do is to establish your own personal HRV baseline, the level to which your HRV reverts when you are fully recovered from exercise and are not facing any other unusually high levels of stress. To do so, you will ideally need at least a week’s worth of readings (recorded daily), but the longer you take readings, the more accurate your baseline will be. Taking readings simply requires strapping the heart rate monitor on, firing up the app and relaxing for approximately 3 minutes, whilst the app records your heart rate and Heart Rate Variability data. This is all done moments after waking up each morning, and will give you easily interpreted and useable data about the state of your physiology and your readiness to exercise intensely on that particular day. 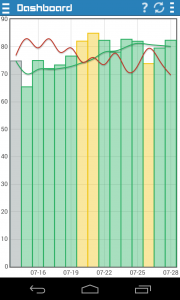 Once you have established your personal HRV baseline (via daily app readings), you will be able to tell when you dip below baseline and enter into a SNS dominant state and when you are at or slightly above baseline in a more PSNS dominant state. It is typically the case that immediately after, and during the days following high intensity exercise, HRV decreases. You will want to perform your high intensity workouts on days, when you have recovered from your previous workout and you have returned to, or are slightly above our personal HRV baseline, in other words when you are in PSNS dominant mode. In part 2 of “The Beginner’s Guide to HRV”, I will cover the merits of the HRV tracking apps and go into much greater detail as to how to use HRV data to schedule intense resistance training workouts for optimal benefit. 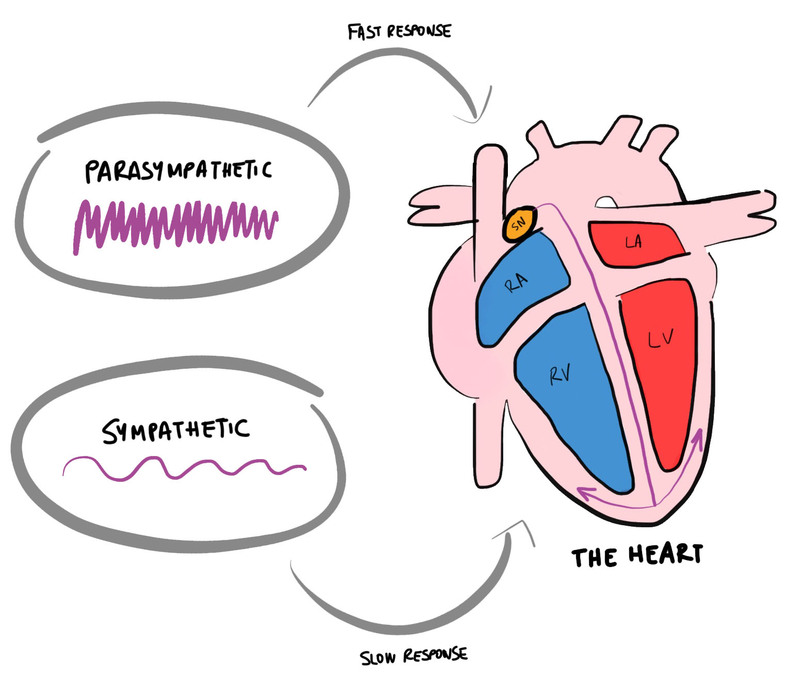 The heart is stimulated to produce a beat by the sinoatrial node. The frequency with which the sinoatrial node produces an impulse that will stimulate a heartbeat, is influenced primarily by the Parasympathetic Nervous System and the Sympathetic Nervous System. Although it might seem that the heart beats with “uniform rhythmic regularity”, it does not. There is variation in the length of time between each beat. Variation is a good thing and measurement of this variation can provide us with valuable insight into the current state of our physiology. Inexpensive apps are now available that can measure Heart Rate Variability. We can use HRV data to decide when it is optimal to exercise intensely. In the next post, I will be going into details into what kind of apps are available to use, how to take readings and establish your HRV baseline, as well as how to interpret your HRV score. Great write up, i am a developer working with HRV and found your article very informative, i look forward to reading part 2, any ETA on when it will come out? Thanks Aaron. Working on part 2 now, will be up tomorrow or Friday.